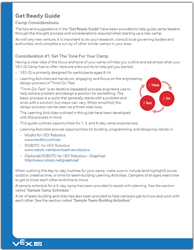 The VEX IQ Robotics Camp Handbook enables you to hold a robotics camp regardless of your experience level. 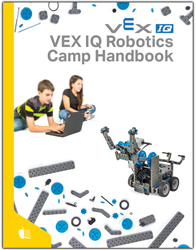 This handbook gives educators, competition teams, and community volunteers the in-depth training materials and other resources they need to provide a great robotics experience for students of all ages. By covering a variety of topic options and providing support for multiple camp structures, this handbook is adaptable to your specific needs & circumstances.